RV storage can be a very important consideration when choosing your RV of the future. Depending on your plans, it can be critical for your peace of mind. Many non-Fulltimers needn't worry - storage is what the house, garage or shed is for! However, if you are considering life on the road as a Fulltimer or certainly thru several "possible" seasons of the year, RV Storage must be in the equation. We've made several modifications to our interior to help us have more storage room. Bins and totes will become your "friends" very quickly. 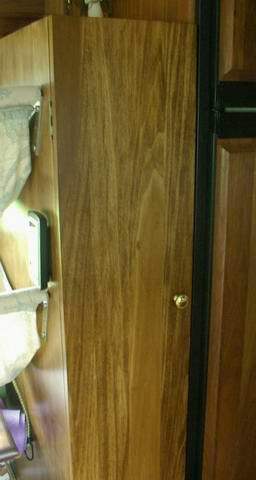 The underneath storage areas of an RV are just as important. We are fortunate to also have a "sealed" bin for food storage. Never realized how important that was until we thought about it - after the fact, of course! Aside from a sealed storage area, most larger coaches and some 5th wheels will have a "pass-thru storage" feature. These are just a wonderful feature. Many people will install a slider drawer option as well. These are great, because they will allow you to put everything on them and then slide the entire drawer mechanism underneath. The down side of these is that you lose quite a bit of actual storage space for all the systems to be installed - and quite frankly, will make you lazier! Sorry - but, they will. Nothing like pulling out a bunch of tots and crawling into a bin to drag out the one in the deep center that you need for a "mini-workout"!! How about a Small Space Food Storage Idea? 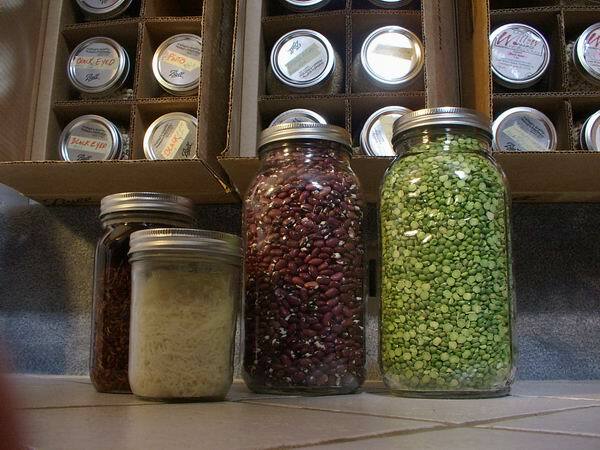 How about a great Food Storage Idea for your RV? Changing the Dining Room Table - Changed everything!! 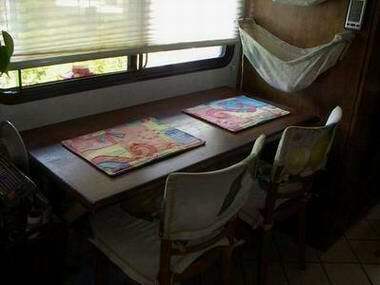 One of our best RV Storage ideas was to remove the kitchen table that was perpendicular to the walls. We removed that completely and added a table top on a piano hinge to the same wall, underneath a large window. This allowed us to share meals while looking outside - instead of having to face each other!! Switching the table design gave us an extra 13 inches between the refrigerator and the new table. Since we didn't have to allow for the chairs to move towards the refrigerator any more, this was an incredible space change. 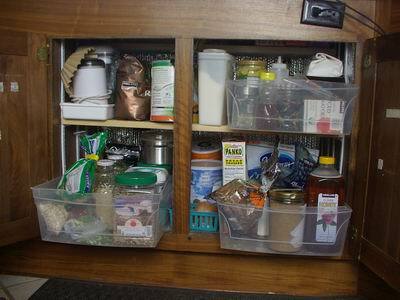 As you'll notice, we then added a wonderful RV PANTRY!! YEAH!! 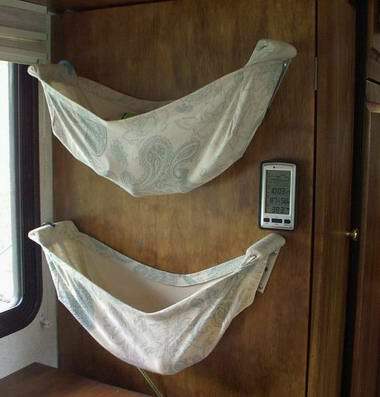 While staring at the new huge wall of the RV pantry, the hanging fruit or general storage bags became an awesome idea! Amazing how much those two "bags" can hold! 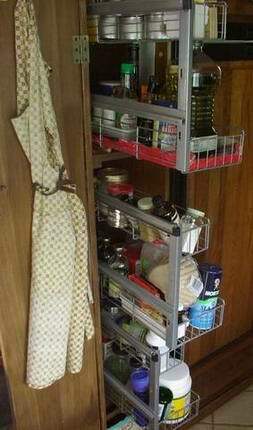 We built the pantry pretty quickly, stained it and voila - a great storage addition. Switching the kitchen table was the catalyst for this entire addition. 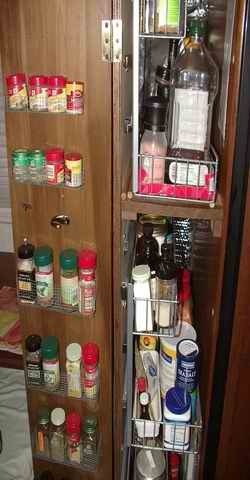 Since we only had 9" of "space" inside the pantry, we had to come up with a system to get things quickly and easily. If you've ever been to IKEA , you know they are the "solution" place. Off we went, searching for a type of deep slider that was narrow and long. After building and attaching all our sliders, we needed a secure way to keep them closed while cruising down the highways and byways! 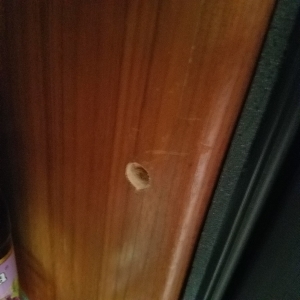 We just used a dowel and drilled a hole into the side of the refrigerator cabinet (just the outer covering!!) 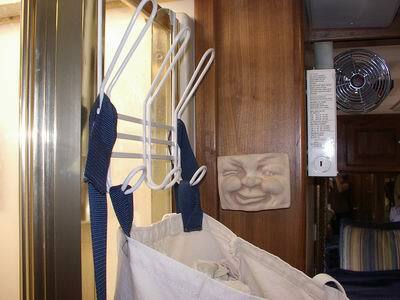 and attached a little 1/2 circle clip on the outer pantry wall that would hold the dowel in place. 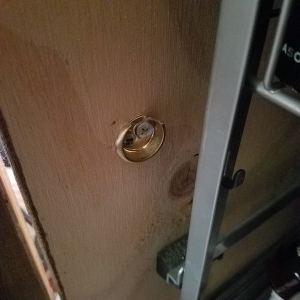 Just insert the dowel in the full hole in the cabinet and then push it into the half circle clip so it is locked into place! This was a great solution for keeping the sliders locked in place while driving! Locking Dowel in place so slider doesn't come open while traveling. Just open your mind and look around your interior spacing - is there something that can be eliminated or changed to add to your benefit?!? 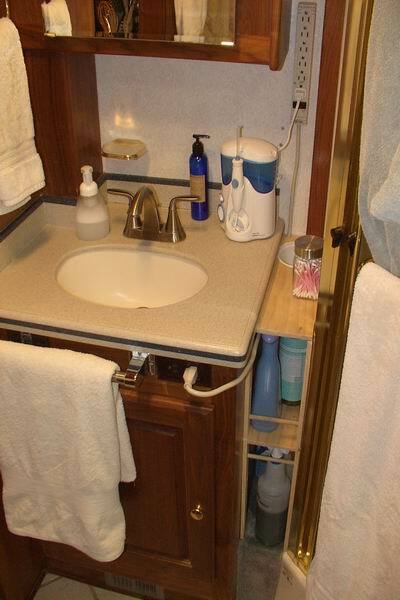 Aside from all the kitchen modifications you may be able to do, you'll always be looking for those totes that are just the right size for your cabinets and storage bins - RV Storage at its best! 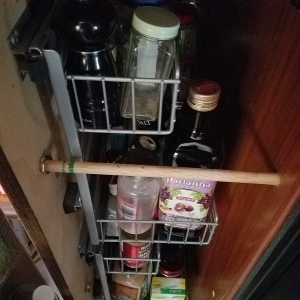 Hidden storage is also important - just to be able to utilize all that excess area that just isn't visible to us - behind cabinet drawers is a great place. Under the bottom drawer is another great idea for hidden storage. We pack a lot of our "extra supplies" there. 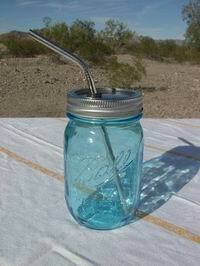 Great ideas for items you stock up on - food, cleaning supplies, medicinal stuff - whatever works for the individual! 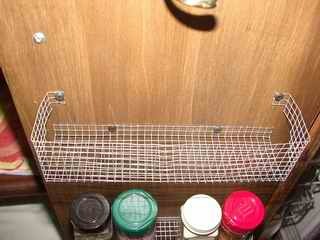 Here's the final version of the Pantry storage door with a screen mesh shelf. We added a total of SIX of these for all the spices! Works out really well - plus you can see every label - all the time!! Yeah!